Stories from the November 11, 2013 issue of the GW Hatchet. View a PDF version of this issue. About 8,600 miles away from the ravaged cities in the Philippines, assistant geography professor Nuala Cowan has worked with volunteers nearly every day this week to help rebuild the region by recreating maps. She said on the first day, 90 people showed up. Over the last year, deanships in the law and business schools have been cut short after highly publicized tussles with faculty and top administrators over governance and budgets. Now, the University’s recruiting message will stress a stronger support structure to transition new leaders. CapMac co-owners Brian Arnoff and Vicky Harris have looked into storefronts in the D.C., Maryland, and Virginia area – and specifically around GW’s neighborhood – but have not yet pinned down a location. 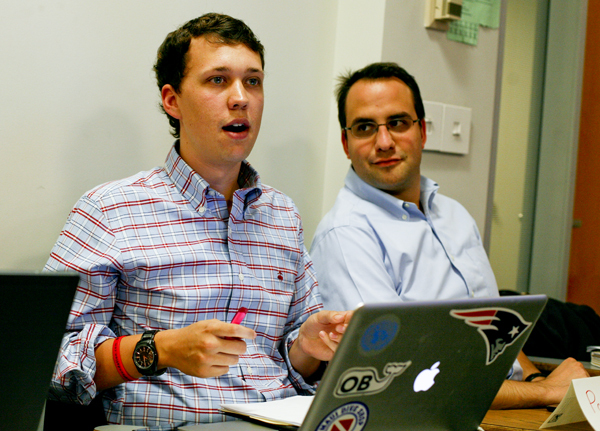 The SA Finance Committee previously planned to only give out funds in the spring, but student leaders said they decided to bring back fall allocations to give GW’s 35 new groups a chance for funding. Gray, who has all the trappings of a mayoral candidate, has remained silent on his plans for 2014. He did not participate in the debate, which was hosted by the D.C. Bar Association, though the organization invites incumbents. About one-third of the halls reduced their electric use and roughly three-quarters reduced their water use from their historic averages, said Shannon Ross, a coordinator in the Office of Sustainability. The number of undergraduate students from China by 20 percent this year, continuing a steady clip of growth that allows GW to keep up with its international enrollment goals. Over the course of a month, Zoe Hall, a sophomore at Albert Einstein High School, created a drawing based only on an essay Regier wrote describing his time in the Marines as part of a first-time project organized by GW’s Office of Military and Veteran Student Services. At the end of a 14-month internal study of its workplace culture, a group of top officials gave positive marks to GW for meeting or exceeding nearly all national standards of compliance.